Airbus SE (/ˈɛərbʌs/; French: [ɛʁbys] ( listen); German: [ˈɛːɐ̯bʊs]; Spanish: [ˈeiɾβus]), from 2000 to 2014 known as the European Aeronautic Defence and Space Company (EADS), is a European multinational aerospace corporation, registered in the Netherlands and trading shares in France, Germany and Spain. It designs, manufactures and sells civil and military aerospace products worldwide and manufactures in the European Union and various other countries. The company has three divisions: Commercial Aircraft, Defence and Space, and Helicopters, the third being the largest in its industry in terms of revenues and turbine helicopter deliveries. 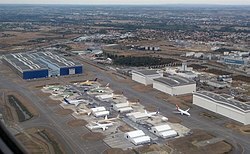 The company's main civil aeroplane business is based in Blagnac, France, a suburb of Toulouse, with production and manufacturing facilities mostly in the European Union (France, Germany, Spain, United Kingdom) but also in China and the United States. Final assembly production is based in Toulouse, France; Hamburg, Germany; Seville, Spain; Tianjin, China, and Mobile, Alabama, United States. The company produces and markets the first commercially viable digital fly-by-wire airliner, the Airbus A320, and the world's largest passenger airliner, the A380. The 10,000th aircraft, an A350, was delivered to Singapore Airlines on 14 October 2016. The global Airbus fleet have performed more than 110 million flights, totaling over 215 billion kilometres and carrying 12 billion passengers. Airbus's corporate headquarters is located in Leiden, Netherlands, and the main office is located in Toulouse, France. The company is led by CEO Guillaume Faury and is a component of the Euro Stoxx 50 stock market index. The current company is the product of consolidation in the European aerospace industry tracing back to the formation of the Airbus Industrie GIE consortium in 1970. In 2000, the European Aeronautic Defence and Space Company (EADS) NV was established. In addition to other subsidiaries pertaining to security and space activities, EADS owned 100% of the pre-existing Eurocopter SA, established in 1992, as well as 80% of Airbus Industrie GIE. In 2001, Airbus Industrie GIE was reorganised as Airbus SAS, a simplified joint-stock company. In 2006, EADS acquired BAE Systems's remaining 20% of Airbus. EADS NV was renamed Airbus Group NV and SE in 2014, and 2015, respectively. Due to the dominance of the Airbus SAS division within Airbus Group SE, these parent and subsidiary companies were merged in January 2017, keeping the name of the parent company. The company was given its present name in April 2017. The longer-range widebody products— the twin-jet A330 and the four-engine A340— have efficient wings, enhanced by winglets. The Airbus A340-500 has an operating range of 16,700 kilometres (9,000 nmi), the second longest range of any commercial jet after the Boeing 777-200LR (range of 17,446 km or 9,420 nautical miles). Airbus is studying a replacement for the A320 series, tentatively dubbed NSR, for "New Short-Range aircraft". Those studies indicated a maximum fuel efficiency gain of 9–10% for the NSR. Airbus however opted to enhance the existing A320 design using new winglets and working on aerodynamical improvements. This "A320 Enhanced" should have a fuel efficiency improvement of around 4–5%, shifting the launch of an A320 replacement to 2017–2018. On 24 September 2009, the COO Fabrice Bregier stated to Le Figaro that the company would need from €800 million to €1 billion over six years to develop the new aircraft generation and preserve the company technological lead from new competitors like the Chinese Comac C919, scheduled to operate by 2015–2020. In June 2013, Airbus announced that it was developing a range of "smart suitcases" known as Bag2Go for air travellers, in conjunction with luggage-maker Rimowa and IT firm T-Systems. The cases feature a collection of built-in electronic gadgets which communicate with a smartphone app and with the IT systems of the airline, to assist the traveller and improve reliability and security of baggage handling. Gadgets include a weighing scale and a location tracker, using GPS for location tracking, RFID for identification, and a SIM card for messaging. Since then, similar products have been announced by other companies. In January 1999 Airbus established a separate company, Airbus Military SAS, to undertake development and production of a turboprop-powered tactical transport aircraft, the Airbus Military A400M. The A400M is being developed by several NATO members, Belgium, France, Germany, Luxembourg, Spain, Turkey, and the UK, as an alternative to relying on foreign aircraft for tactical airlift capacity, such as the Ukrainian Antonov An-124 Ruslan and the American C-130 Hercules. The A400M project has suffered several delays; Airbus has threatened to cancel the development unless it receives state subsidies. Pakistan placed an order for the Airbus A310 MRTT in 2008, which will be a conversion of an existing airframe as the base model A310 is no longer in production. On 25 February 2008 Airbus won an order for three air refuelling MRTT aircraft, adapted from A330 passenger jets, from the United Arab Emirates. On 1 March 2008 a consortium of Airbus and Northrop Grumman had won a $35 billion contract to build the new in-flight refuelling aircraft KC-45A, a US built version of the MRTT, for the USAF. The decision drew a formal complaint from Boeing, and the KC-X contract was cancelled to begin bidding afresh. Data as of 31 December 2018. Airbus opened an assembly plant in Tianjin, People's Republic of China for its A320 series airliners in 2009. Airbus started constructing a $350 million component manufacturing plant in Harbin, China in July 2009, which will employ 1,000 people. Scheduled to be operated by the end of 2010, the 30,000 square metre plant will manufacture composite parts and assemble composite work-packages for the A350 XWB, A320 families and future Airbus programmes. Harbin Aircraft Industry Group Corporation, Hafei Aviation Industry Company Ltd, AviChina Industry & Technology Company and other Chinese partners hold the 80% stake of the plant while Airbus control the remaining 20%. Plans for a Mobile, Alabama aircraft assembly plant were unveiled by Airbus CEO Fabrice Brégier from the Mobile Convention Centre on 2 July 2012. The plans include a $600 million factory at the Mobile Aeroplex at Brookley for the assembly of the A220, A319, A320 and A321 aircraft. It could employ up to 1,000 full-time workers when operational. Construction began on 8 April 2013, and became operable by 2015, producing up to 50 aircraft per year by 2017. As of 22 June 2018[update], 73.6 % of Airbus Group stock is publicly traded on six European stock exchanges, while the remaining 26.4 % is owned by a "Contractual Partnership". As at 26 April 2018, the partnership is owned by SOGEPA (11.1%), GZBV (11.1%) and SEPI (4.2%). SOGEPA is owned by the French State, GZBV is majority owned by KfW, while SEPI is a Spanish state holding company. On 2 June 2006 co-CEO Noël Forgeard and Airbus CEO Gustav Humbert resigned following the controversy caused by the June 2006 announcement that deliveries of the A380 would be delayed by a further six months. Forgeard was one of a number of executives who exercised stock options in November 2005 and March 2006. He and 21 other executives are[when?] under investigation as to whether they knew about the delays in the Airbus A380 project which caused a 26 % fall in EADS shares when publicised. In July 2004 former Boeing CEO Harry Stonecipher accused Airbus of abusing a 1992 bilateral EU-US agreement providing for disciplines for large civil aircraft support from governments. Airbus is given reimbursable launch investment (RLI), called "launch aid" by the US, from European governments with the money being paid back with interest plus indefinite royalties, but only if the aircraft is a commercial success. Airbus contends that this system is fully compliant with the 1992 agreement and WTO rules. The agreement allows up to 33% of the programme cost to be met through government loans which are to be fully repaid within 17 years with interest and royalties. These loans are held at a minimum interest rate equal to the cost of government borrowing plus 0.25%, which would be below market rates available to Airbus without government support. Airbus claims that since the signature of the EU-US agreement in 1992, it has repaid European governments more than U.S.$6.7 billion and that this is 40% more than it has received. In January 2005 the European Union and United States trade representatives, Peter Mandelson and Robert Zoellick respectively, agreed to talks aimed at resolving the increasing tensions. These talks were not successful with the dispute becoming more acrimonious rather than approaching a settlement. ^ a b c Airbus Group SE Financial Statements 2018 (PDF). Airbus. Retrieved 18 February 2019. ^ a b c Airbus Group SE Financial Statements 2016 (PDF). Airbus. Retrieved 28 February 2017. ^ "Airbus annual report for 2017" (PDF). airbusgroup.com. ^ "About Airbus". Airbus. Retrieved 16 June 2017. ^ "First Airbus final assembly line outside Europe inaugurated in Tianjin, China". Airbus. 28 September 2008. ^ Beatson, Jim (2 April 1989). "Air Safety: Is America Ready to `Fly by Wire'?". The Washington Post. ^ "History – Imaginative advances". Airbus. Archived from the original on 27 December 2009. Retrieved 30 September 2009. ^ "A journey of 10,000 aircraft and counting: Airbus' pioneering spirit and commitment to shaping the future" (Press release). Airbus. 14 October 2016. ^ "." Airbus. 15 March 2018. Updated 15 March 2018. Retrieved on 15 March 2018. ^ "BAE Systems says completed sale of Airbus stake to EADS". Forbes. 13 October 2006. Archived from the original on 19 March 2007. Retrieved 13 October 2006. ^ "EADS changes name to Airbus" (subscription required). Financial Times, 2014. ^ "Airbus Group Shareholders Approve All Resolutions At 2015 AGM" (Press release). Airbus Group. 27 May 2015. Retrieved 25 August 2016. ^ "Airbus shareholders approve all resolutions at 2017 AGM" (Press release). Airbus. 12 April 2017. Retrieved 12 April 2017. ^ "Simon Calder: The man who pays his way". The Independent. UK. 18 October 2003. Retrieved 23 April 2010. ^ a b Ostrower, John (10 November 2011). "EADS indicates "termination" of Airbus A340 programme". Flightglobal. Retrieved 11 November 2011. ^ "Airbus may not do A320 replacement alone". Aviation Week. 2 July 2007. ^ "The 737 Story: Smoke and mirrors obscure 737 and Airbus A320 replacement studies". Flight International. 7 February 2006. Retrieved 4 September 2011. ^ "Airbus aims to thwart Boeing's narrowbody plans with upgraded 'A320 Enhanced'". Flight International. 20 June 2006. ^ "China names first jumbo jet C919, to take off in 8 years". Xinhua News Agency. 6 March 2009. Retrieved 8 September 2009. ^ "Airbus needs extra cash for new planes". Reuters. 24 September 2009. Retrieved 1 July 2011. ^ "Airbus to base A320 production in Hamburg, 350s and 380s in Toulouse". Forbes. 15 January 2007. Archived from the original on 12 October 2007. ^ Webster, Ben (1 May 2003). "BA chief blames French for killing off Concorde". The Times. UK. ^ Woodman, Peter (10 April 2003). "End of an era – Concorde is retired". The Independent. UK. ^ Business, Jethro Mullen and Charles Riley, CNN. "End of the superjumbo: Airbus is giving up on the A380". CNN. Retrieved 16 February 2019. ^ "Airbus Executive and Private Aviation". airbus.com. Archived from the original on 20 April 2010. Retrieved 6 June 2015. ^ David Flynn (7 June 2013). "Airbus reveals iPhone-enabled 'smart bag' with RFID, GPS tracking". Australian Business Traveller. Retrieved 30 March 2015. ^ "Applying innovation to improve the airline luggage experience". Airbus. 20 June 2013. Archived from the original on 2 April 2015. Retrieved 30 March 2015. ^ "Airbus Bag2Go Uses GPS And RFID To Get Your Bags Where They Belong". GadgetReview.com. 10 June 2013. Retrieved 30 March 2015. ^ Shawn Knighe (7 June 2013). "Airbus Bag2Go smart luggage packs mobile radio, GPS and RFID". TechSpot. Retrieved 30 March 2015. ^ "A400M Programme: A Brief History". Airbus. Archived from the original on 1 July 2014. Retrieved 17 January 2014. ^ "Strategic airlift agreement enters into force". NATO. 3 March 2006. ^ O’Connell, Dominic (11 January 2009). "RAF transport aircraft delay". The Times. UK. ^ Hoyle, Craig (28 April 2008). "Hercules support deal transforms RAF operations". Flight International. ^ "Why wait for the Airbus?". Defence Management. 5 May 2009. Archived from the original on 9 July 2011. ^ "Airbus A400M delay does not foster confidence". Forbes. 30 October 2007. ^ Hollinger, Peggy; Clark, Pilita; Lemer, Jeremy (5 January 2010). "Airbus threatens to scrap A400M aircraft". Financial Times. ^ Hepher, Tim (25 February 2008). "Airbus EAE tanker order". Reuters. ^ "Air tanker deal provokes US row". BBC News. 1 March 2008. Retrieved 4 September 2011. ^ "Boeing Protests U.S. Air Force Tanker Contract Award". Boeing. 11 March 2008. Archived from the original on 14 March 2008. ^ "Statement regarding the bid protest decision resolving the Aerial Refueling Tanker protest by the Boeing Company" (PDF). United States Government Accountability Office. 18 June 2008. ^ "SecDEF announces return of KC-X program". Secretary of the Air Force Public Affairs. 16 September 2009. ^ Wolf, Jim; Shalal-Esa, Andrea (24 September 2009). "Pentagon's new tanker rules exclude trade fight". Reuters. ^ "Airbus Group teams up with Aerion" Leeham Co, 27 October 2014. Accessed: 26 September 2014. ^ Van Wagenen, Juliet. "Airbus and Aerion Collaborate to Develop Supersonic Business Jet, High-Performance Flight" Aviation Today, 22 September 2014. Accessed: 27 October 2014. ^ "Airbus Numbering System". aerospaceweb.org. Retrieved 1 October 2009. ^ "Airbus delivers first A330-900 to launch operator TAP Air Portugal". Airbus, 26 Nov 2018. ^ "Airbus official O&D". www.airbus.com. Airbus. 30 September 2018. Retrieved 8 October 2018. ^ a b "Investors & Shareholders". airbusgroup.com. Retrieved 25 August 2016. ^ "EADS demonstrates world's first high speed data solution over TETRA". Bapco Journal. Archived from the original on 7 July 2011. Retrieved 12 July 2011. ^ EADS changes name to Airbus, subscription required. ^ "EADS Registration Document 2013 (Page 48)" (PDF). EADS. Retrieved 12 February 2015. ^ "Airbus APWorks". Archived from the original on 10 February 2015. Retrieved 10 February 2015. ^ "Executive and Operational Committees". Airbus. 11 April 2019. Retrieved 12 April 2019. ^ "EADS N.V. – Board of Directors – Role and Composition". EADS. Archived from the original on 16 February 2010. Retrieved 12 July 2011. ^ "EADS Finds Way Out of Crisis". Business. Deutsche Welle. Agence France-Presse. 25 June 2005. ^ "Airbus Middle East - Airbus, Commercial Aircraft". Archived from the original on 6 March 2016. Retrieved 9 March 2016. ^ "People & Organization - Airbus, Commercial Aircraft". Archived from the original on 9 March 2016. Retrieved 9 March 2016. ^ "コンタクト - Airbus, 欧州の航空機メーカー". ^ Bray, Rob (June 2007). "Supersize Wings". Ingenia. Archived from the original on 20 May 2012. Retrieved 2 December 2008. ^ "Airbus to build A320 jet assembly line in Tianjin in 2006". AsiaInfo Services. 18 July 2006. Archived from the original on 11 August 2011. ^ "Airbus delivers first China-assembled A320 jet". Sify News. 23 June 2009. ^ "Airbus signs framework agreement with Chinese consortium on A320 Final Assembly Line in China". Airbus official. 26 October 2006. Archived from the original on 14 December 2006. ^ Jianguo, Jiang (16 July 2008). "Airbus, Harbin Aircraft form Chinese parts venture". Bloomberg. ^ Kogan, Eugene (8 February 2008). "China's commercial aviation in take-off mode". Asia Times. ^ "China needs 630 more regional jets in next 2 decades". China Daily. 2 September 2007. ^ "Airbus starts $350 million Harbin plant construction". China Daily. 1 July 2009. ^ "Airbus offers sneak-peek inside Alabama A320 factory". 14 September 2015. ^ Melissa Nelson-Gabriel (2 July 2012). "Airbus to Build 1st US Assembly Plant in Alabama". Associated Press. Retrieved 2 July 2012. ^ "Airbus confirms its first US factory to build A320 jet". BBC News. 2 July 2012. Retrieved 2 July 2012. ^ Jolly, Jasper (14 February 2019). "A380: Airbus to stop making superjumbo as orders dry up". Retrieved 18 February 2019 – via www.theguardian.com. ^ Roberston, David (5 October 2006). "MoD tells European leaders to stop meddling in EADS". The Times. UK. Retrieved 15 October 2006. ^ "Airbus plays catch-up with A350 jet." Phillips, D. International Herald Tribune. 11 April 2006. ^ "EADS shares up on Vneshtorgbank reports[dead link]." Yahoo News. 30 August 2006. ^ John, Isaac. "Dubai Int'l Capital buys 3.12pc stake in EADS" Archived 26 September 2007 at the Wayback Machine, Khaleej Times, 6 July 2007. ^ The SIPRI Top 100 arms-producing companies, 2008 Archived 24 May 2011 at the Wayback Machine Stockholm International Peace Research Institute, 12 April 2010. Retrieved: 4 May 2010. ^ "Portfolio changes and strategic cooperations". Annual Report 2013. Daimler. 21 February 2014. Daimler sells remaining equity interest in EADS: On March 27, 2013, the extraordinary shareholders’ meeting of EADS approved a new management and shareholder structure. Subsequently, on April 2, 2013, the shareholders’ pact concluded in the year 2000 was dissolved and replaced with a new shareholders’ pact without the participation of Daimler. ^ "Share Price & Information: Shareholding structure: Current capital structure". Airbus Group. 26 April 2018. Retrieved 22 June 2018. ^ "Airbus Group Figures". airbus-group.com. Archived from the original on 3 January 2014. Retrieved 8 May 2014. ^ Marcus Theurer (31 January 2014). "Militärausgaben: Die Rüstungsindustrie schrumpft". faz.net. Frankfurter Allgemeine Zeitung. Retrieved 2 February 2014. ^ "Environment | Airbus, a leading aircraft manufacturer". Airbus.com. Archived from the original on 15 January 2013. Retrieved 14 January 2013. ^ "Eco-efficiency | Airbus, a leading aircraft manufacturer". Airbus.com. Archived from the original on 15 January 2013. Retrieved 14 January 2013. ^ Skillings, Jonathan (15 May 2008). "Biofuel gets lift from Honeywell, Airbus, JetBlue". CNET. Retrieved 4 September 2011. ^ "Airbus demonstrates regular customer delivery flights with sustainable jet fuel". Airbus. Retrieved 16 July 2018. ^ "SFO launches criminal probe into deal with Saudi national guard". Exaronews.com. 10 August 2012. Retrieved 20 June 2013. ^ "Third insider blows whistle on 'corrupt' Saudi defence deal". Exaronews.com. 9 July 2012. Retrieved 20 June 2013. ^ "Top ANC official resigns". BBC News. 4 October 2001. Retrieved 12 July 2011. ^ "Court Diary". Armsdeal-vpo.co.za. Retrieved 12 July 2011. ^ a b "Inside story; Share scandals in France". The Economist. The Economist Newspapers. 13 October 2007. ^ Anderson, Jack (8 May 1978). "New European Airbus could affect US jobs". Free-lance Star. ^ Porter, Andrew (29 May 2005). "Trade war threatened over £379m subsidy for Airbus". The Times. UK. ^ "Q&A: Boeing and Airbus". BBC News. 7 October 2004. Retrieved 1 January 2010. ^ "See you in court; Boeing v Airbus: The Airbus-Boeing subsidy row". The Economist. 25 March 2005. ^ Burgos, Annalisa (11 January 2005). "U.S., EU To Settle Airbus-Boeing Dispute". Forbes. ^ "US, EU meet on Airbus-Boeing dispute". Journal of Commerce Online. 24 February 2005. ^ "U.S.-EU Talks on Boeing, Airbus Subsidies Falter". Los Angeles Times. 19 March 2005. ^ Schneider, Howard (19 May 2011). "U.S. claims victory in Airbus-Boeing case". The Washington Post, Bloomberg. Retrieved 19 May 2011. ^ "WTO Rules Boeing Got Improper U.S. Subsidies". The Wall Street Journal. 1 February 2011. Heppenheimer, T.A. (1995). Turbulent Skies: The History of Commercial Aviation. John Wiley. ISBN 0-471-19694-0. Lynn, Matthew (1997). Birds of Prey: Boeing vs. Airbus, a Battle for the Skies. Four Walls Eight Windows. ISBN 1-56858-107-6. McIntyre, Ian (1982). Dogfight: The Transatlantic Battle Over Airbus. Praeger Publishers. ISBN 0-275-94278-3. Thornton, David Weldon (1995). Airbus Industrie: The Politics of an International Industrial Collaboration. St. Martin's Press. ISBN 0-312-12441-4.